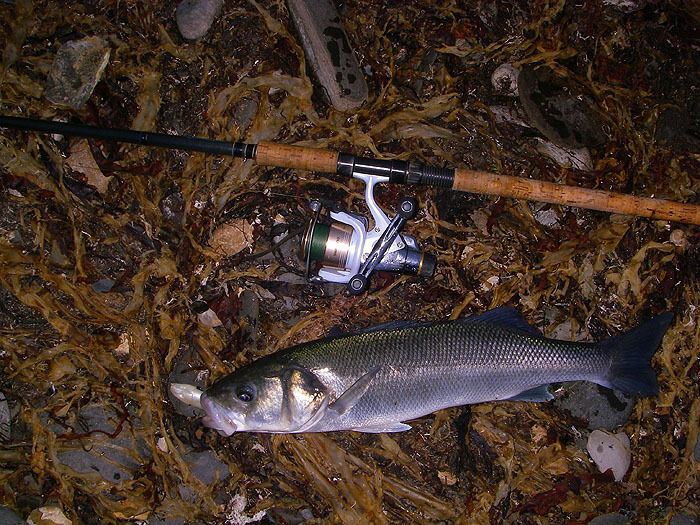 After landing three six-poundish mullet in a session I just had to give it another go on the following evening's tide. This time I was joined by Nigel again and by my other friends Brian Baxter and his son Jamie. Everyone, except me, started after the mullet straight away but I decided to have a chuck with a plug to see if there were any bass about. Sure enough it wasn't long before I landed a modest bass then it was slow (=biteless) for a while so I picked up the fly rod and joined in. There were loads of mullet very close in and with everyone casting, hooking fish, playing fish, losing fish and landing fish it is impossible to remember the exact sequence of events. I know that all four of us landed mullet and that they were all between five-and-a-half and almost seven pounds in weight but one fish was particularly memorable. Nigel and I usually beach our fish before unhooking and releasing them and, to be honest, we lose quite a few when the hook-hold pops at the last minute - just as they are sliding ashore. I suppose that we might regret it if it was a particularly huge thicklip but no doubt in those circumstances we'd take a bit more care to get the fish on the beach. Anyway, on this occasion Brian and Jamie had brought a net with them. Fairly early in the session Jamie netted a cracking mullet for his dad and both Nigel and I went through our usual sequence of landing and losing fish, as on the previous evening all were around the six pound mark, fantastic fishing! Anyway, back to the memorable fish. 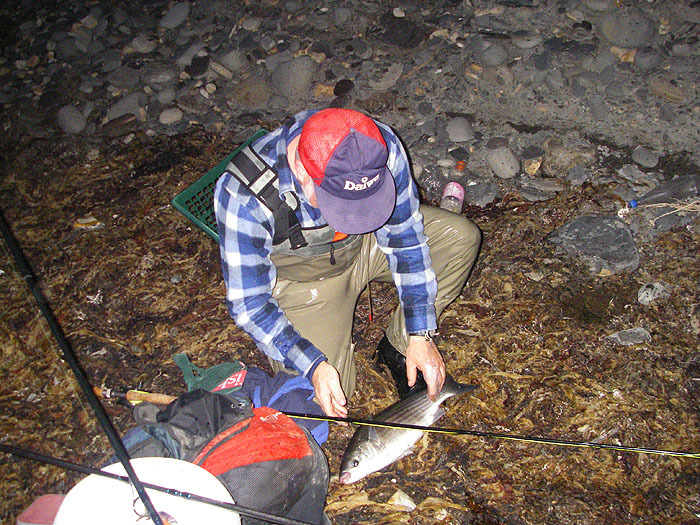 Jamie is a pretty experienced angler and has caught trout on the fly before but as yet had never had a mullet. The gloom was beginning to set in when I looked up and saw him strike into a fish. He told me later that he had actually seen the mullet engulf his fly on the surface - magic! Clearly this was another good fish and with the rod well bent there was at least ten minutes of give and take before I said to Brian, "I'll get the net and give him a hand!" 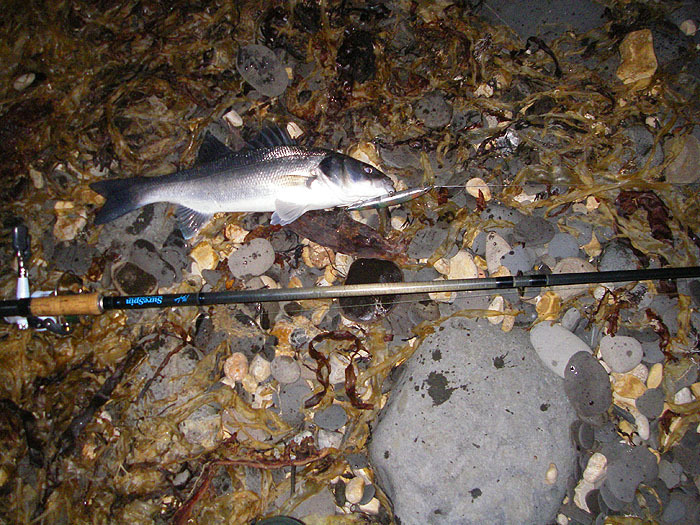 I scuttled back to the pile of gear to pick up the net, leaving my own rod propped against my bag. By the time I got back to Jamie the fish was just making its umpteenth run and taking yet more of the backing. By now twenty minutes must have passed and with his elders muttering things like "Take your time!" and "Don't rush it!" Jamie was gamely playing his mullet as though he'd caught hundreds before. 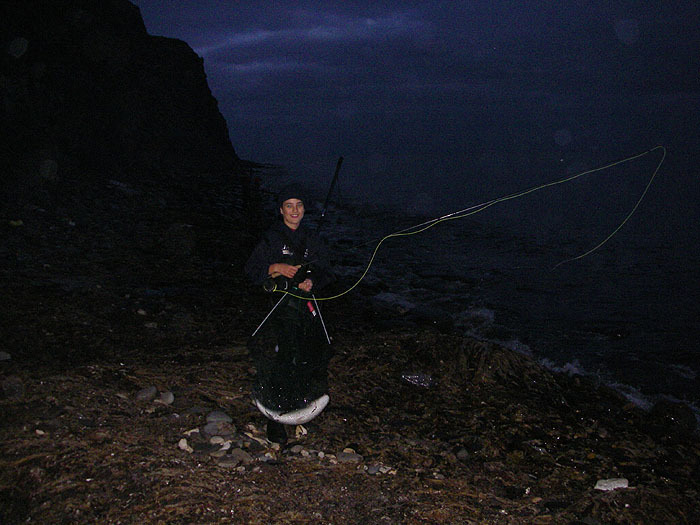 For another twenty minutes I followed him with net in hand, slipping and sliding along the shore as the fish made run after run and by the time I slid the net under the wallowing mullet it was virtually dark. 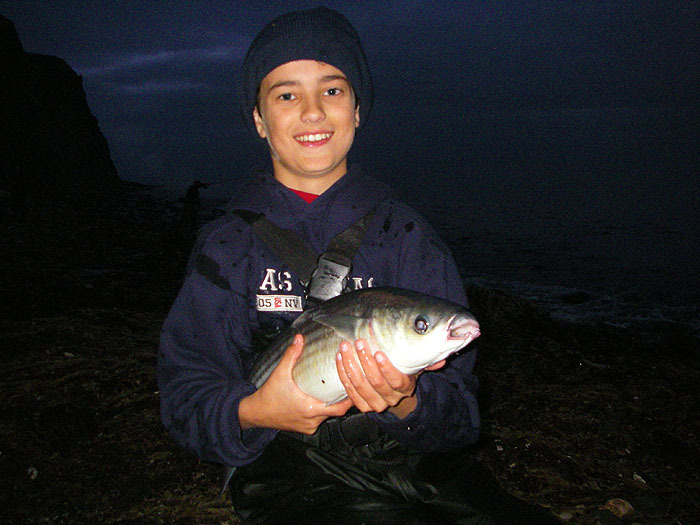 We tramped back to the others (probably a couple of hundred metres) to find that the mullet weighed exactly six pounds - what a beauty for your first sea fish on a fly! I won't forget it and I'm sure that the battle is fixed in Jamies's memory for ever. After that everything was more or less anti-climax. 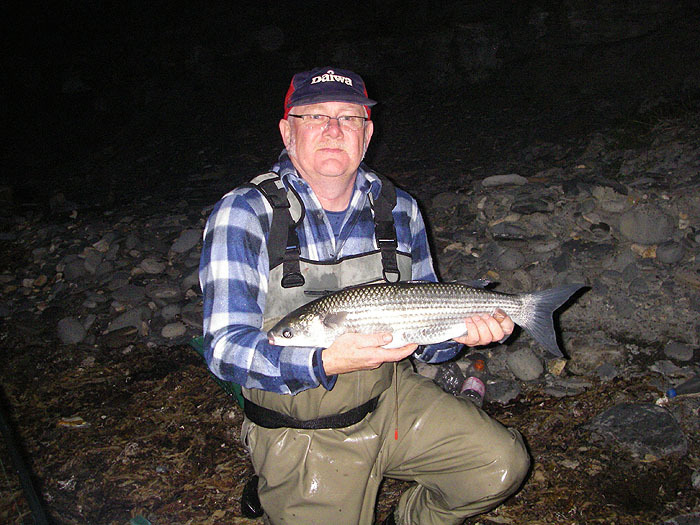 I had a decent bass on a soft plastic and Nigel landed another big mullet before we packed in. What a wonderful evening's fishing.